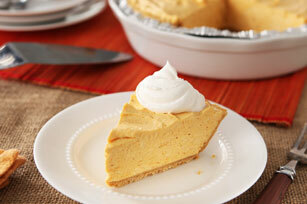 Beat cream cheese, pumpkin, sugar and pumpkin pie spice in large bowl with mixer until blended. Gently stir in 2-1/2 cups Cool Whip. Refrigerate cheesecake and remaining Cool Whip 3 hours. Serve cheesecake topped with remaining Cool Whip. Place completely unwrapped package of cream cheese in microwavable bowl. Microwave on HIGH 10 to 15 seconds or until slightly softened. This easy-to-make cheesecake can be refrigerated up to 24 hours before serving as directed.